I am coming to the end of my confinement. That means Ww is leaving for Canberra soon. He has packed 2 half boxes of books and that's all he is going to ship over..the rest of the boxes are for me to pack. And i can't do that until at least 2 weeks before we fly and also the confirmation of our visas. The thought of packing is messy in my head: what to bring, what not to bring, what to bring later....argh. I want to pack now yet i can't do so. This also means that I'm starting to learn to handle baby & Eliza on my own...without Ww's help. I mean one kid to one adult, that's easy. But i have yet to try out 1 baby & 1 kid to 1 adult. I just needed that courage to do so. And the push is when Ww is really not around to help me, especially in the nights. Eliza has been relatively helpful so far and one of the concerns is really the nights. We'll find out our rhythm somehow. Just like how i relished sleeping with Eliza, when Emily came along i anticipated that i'll be in the baby room most of the time at night, not wanting to disturb her & Ww while they slept. So we dealt with that, that Eliza doesn't come crying (or more like wailing) for me in the middle of the night when she finds that i'm not there. After 2-3 days and the reward of 2 stars & 2 gummies, she did it! And the reward thing only lasted 2 days also. After that she didn't need it anymore. So...i'll figure handling baby at night together with Eliza in the room OR have her sleep on her own which is what we'll be working towards. Anyway tonight Eliza has gone over to my in-laws place to stay over cos Ww is out meeting his friends for dinner. I, missing Eliza, did want her to stay home instead at the last minute which she somewhat wanted too (probably cos i was playing silly running around games with her), just that we have prepared my in-laws and i guess i didn't want to change stuff too much. I'm starting to follow Gina Ford's routines for the past 2 days, with some mixed success. The split feed is confusing for me cos Emily can't last half a feed for an hour...she need it soon! BUT with the split feed, she really does sleep longer, possibly cos she feels fuller...and is sleeping on her tummy. So while the night time has a split feed at 10pm & 11pm, and she's supposed to last till 2.30-3am, she has woken up earlier at 2am and then at 5am for a feed. So we're still at 2 night feeds. While during my initial weeks i have been expressing milk, I have come to find it really a hassle and that it's not something i can do easily when i need to travel and have another kid in tow. Essentially it is the time taken to express milk! Sometimes I just don't want to waste time doing that! For now, i just need to practice latching her on well, even on the move. Her latching has improved even though we do struggle a good few minutes sometimes. There's always the firsts...last time was the first time bringing baby Eliza out, going out for longer periods etc. Now it's breastfeeding on the go, bringing Eliza and Emily out, taking care of them on my own, cooking(!!!)...etc. I'm apprehensive but we'll just try and go along with the flow and get better at it. So i did the 2nd wash today! So far the stains got off! without me having to scrub them! yays! Well except for one which has a slight yellowish tinge..which i would have guessed was due to me washing it in hot water. (i couldn't help it, it was such a blazing hot day that the water that came out of the tap was hot!) Yes so the thing is the cold water is the part that removes the stains, hot water kinda fixates the stains and the purpose of hot water is actually to sanitize the clothing. Then the extra rinse is to get rid of extra detergent as build up of detergent is the cause of smelly nappies. And sun oh wonderful sun actually is the other stain remover. Too bad today was a cloudy & rainy day else it'll be great to blaze the nappies in the sun! 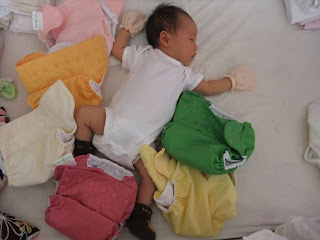 Phews...so we're likely to get our next 6 cloth diapers before the offer ends. So far so good...i've used 3 disposables in between the wash :) My one problem is that while baby can wear onesies over cloth diapers, i still find it quite puffy and if the onesies is tight like what she is wearing now, it's hard to button up. Seems like this week is getting better in a way that I'm getting the hang of Emily's wake, sleep, feed times. She still does her 2hr milk drinking at some point in the day but the nights have been kinda better. I have started to fully latch her to BF at night so i fall asleep while she drinks and then i fall asleep burping her (oops)..so in a way she falls asleep in my arms and with me in bed. Previously i have been bottle feeding her EBM so by the time i get woken by her, i still need time to warm up the milk and after which to express the milk. So...if she doesn't fall asleep after that, i'm stuck. So i have been having a decent night sleep despite going off to sleep at about 12mn and starting my day about 6-7am. This means she wakes up about 3am for the night feed. Hopefully she'll start to stretch her nights and i can have a better night sleep. In the day i feed her by bottle though...so i do have to spend time expressing milk. I really wonder how can i manage that when i'm on my own :S At least Emily's fine with latching on these days..it is still a struggle with me somewhat having to 'force' her cos she'll be so flustered her hands are pushing me away and she's always pulling away. Eliza's been a great sport while i express milk and deal with baby stuff. Sometimes she'll want to sit in the room with me and watch Sesame street videos. She doesn't know what to do with Emily when Emily cries and will tell Emily "It's ok. Jiejie is here...It's ok!" Awww... Or she'll make things and give to Emily or say that Emily cries because she wants this or that. I miss her loads though...cos on weekends my Ww and my in-laws will bring her out or she'll sleep over at my in-laws place. And like today, my mil sent her to and from school, brought her out and bought stuffs for her, till Eliza refused to stay home with us and wanted to stay over at my mil's place. :S She did go in the end though i told her she'll still need to stay home the rest of the weekdays. Starting to prepare for Ww's departure...:( Gonna miss him and the extra pair of hands to do stuff around the house for next 30 days. But we'll need that time away to get the house in Canberra ready and pack. Our visa applications are still processing and it is slightly delayed cos my blood tests came back slightly higher for one of the Hep B markers Fetaprotein (the normal range is <16 and mine came up to be 34). It is worrying not only because it affects the visa application but that whether I am ok. I still want to be around for my girls! Anyway i went to do the ultrasound test today which went quite ok though the doctor will still need to review it first. Pray hard I'm ok...and that maybe the marker was high cos i was eating some chinese herbal stuff? This visa application with all the medical checkups has set us back about $1.1k. super ex. The fact that if we had done it with Ww then, we wouldn't have to pay that extra $700+. We have ventured into cloth diapers cos I read about it in YoungHouseLove about their cloth diaper experience. They make it so much easier to understand cos everytime i run into a cloth diaper web page I just don't quite fully understand how it is in a life of a family using cloth diaper. The main purpose is to save money while we are there...(although it has many other more benefits). I got those from BumGenius from a Singapore wholesaler who's having a buy 5 get 1 free promo. Which makes each diaper with 2 inserts $28.33. Actually i got only 6 pieces cos I wasn't sure if i would take to it. At most I can buy another 6 before 31st may when the offer ends. The best part is they sent it right to my door. i loOVE the colours and so far the only thing that give me jitters is not so much spraying the poop off the diaper (actually it is quite satisfying to get rid of it), but the washing part. Which detergent to use? What wash? pre-wash cold, wash hot, extra rinse. soo..many steps..and the best part is my mil in all good intentions went to soak it in the Kodomo detergent and possibly scrubbed the yellow poop stain away. It is quite unbelievable that machine washing it will remove the stain. I'll have to try it the next round. So far so good..it has leaked last night cos i just left it on so long and didn't put an extra layer. 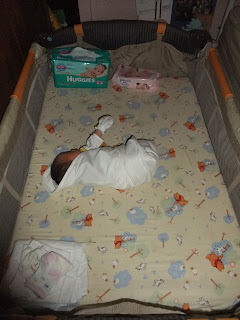 One week after Emily's arrival, we had a 1st week review with the PD. She was losing weight! 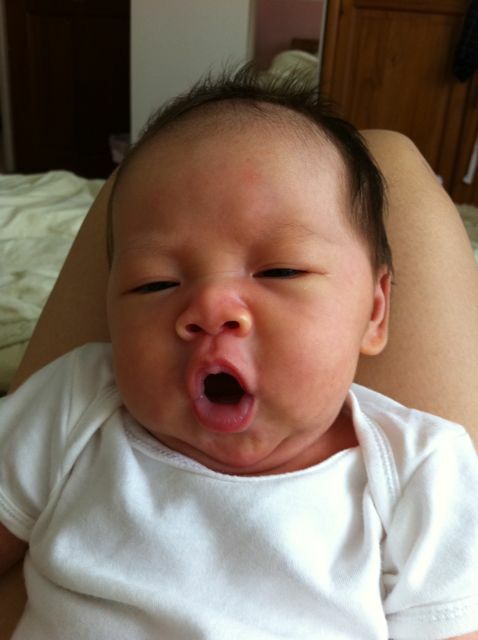 :O frm her birth weight of 2.755 to 2.6+ when we left the hospital and to 2.5+ a week later. Then i was just direct latching her only and we were struggling cos she wasn't latching well at all. I have on the 4-5th day started to express milk to increase supply. Anyway, she had to do a blood test for her jaundice level which came back to be 263 (the normal range is at 100-180). 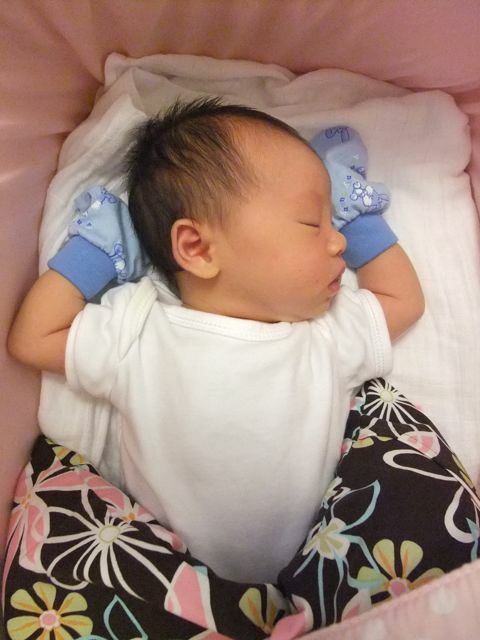 So on that day we had to bring her to the hospital for phototherapy. So goes all the packing and getting ready to go out (in the pouring rain!). I guess my bigger concern wasn't that i wanted her to have EBM and not formula so i even considered going there at night to deliver the milk. :S Later, tiredness got over me and i decided not to anyway.I have the option to stay over with her but with Eliza at home and me wanting a good night sleep, i didn't. After all i knew she'll be well taken care of there. I did go down early the next morning to feed her and actually by mid-day she could be discharged already :) Not too bad just that it cost us $550+ of which $450 is claimable by medisave. This week was also the week to get the hang of things, the routines of feeding Emily (which is not like a routine at all...more like demand feeding!). Actually, it's the routine of our eating times, my mil coming over, Eliza coming home frm sch and having her lunch and naps, expressing milk, bathing baby etc. I have officially broke most confinement rules. I bathed on the 3rd day. (how can you tolderate itchy hair!) 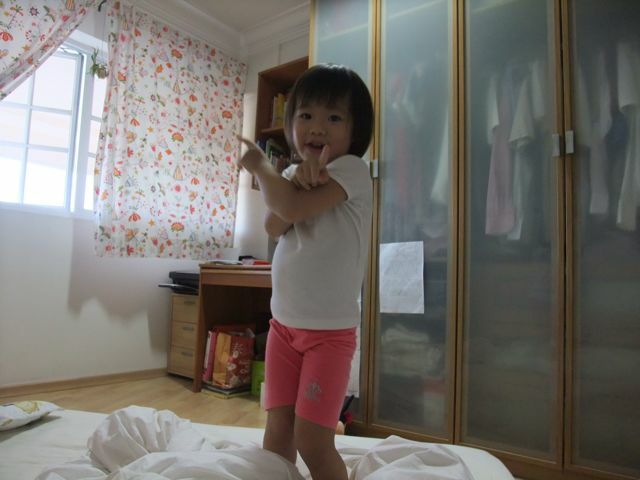 It was a really humid & hot week that had me drenched in perspiration everytime i bathed Emily cos the windows are closed and the fan is turned off. I have also eaten the super yummy Goodwood park durian puffs which are frozen (not supposed to eat cold food during confinement). I've enjoyed cookies and good food that my mum buys back. I don't bother to wear slippers or long sleeves or long pants. I wash my hands and bottles and crockery all the time. I bathed Eliza. Oh well...don't other people around the world do similar stuff? It's the growth spurt week! That explains why Emily can wake up at 2hr intervals rooting for milk. At least this time we know what it is. 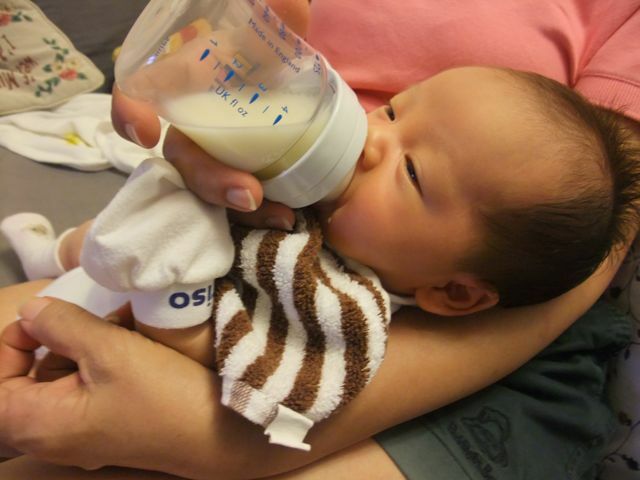 When it was Eliza's growth spurt week, we struggled wondering why she kept wanting to drink milk. The lack of sleep is getting to me...*yawnz*. I was super duper sleepy last night, though thank God Emily wasn't up partying. She drank and she slept. Although she woke at least twice, at 1+am & 4+am. the second round i dozed off while she was drinking milk and the next thing i realized when i woke up was that the milk bottle was on the bed and Emily was sleeping in my arms. This morning at about 630am, i went to snuggle with milk-drinking Eliza and slept again, fed Emily, said bye to school-going Eliza, ate bfast and slept again. Let's pray Emily keeps the sleeping at night going on, I don't think i can keep awake for any baby-partying! This is also the week we collect the kids passports and apply for visa. Finally! This has taken us 2 weeks..gosh i wondered how rushed it would be if Emily arrived much later. Partly also cos it took me 1 week to somewhat get used to Emily, with her going back to the hospital for phototherapy, and the difficult of taking a passport photo of Emily, a newborn's eyes are always closed! We are also dealing with Eliza not expecting me to be with her all the time when she is sleeping. For 2 nights, she has been waking up to cry for me, expecting me to be beside her when she wakes up. This will be the prelude to her sleeping in her own room when we go Australia. Still it is a bit hard on her and us. Some reward helps, so last night she made it through well without crying and got 2 star stickers + 2 gummies. Coming home is exciting...just because. Actually, it's scary too...how will we handle Eliza with Emily? How will Eliza react to her? The nights after Emily came home with us was like day for Emily. She was awake most of the early morning! So was I. :S Thankfully, I had enough rest and has shed the pregnancy tiredness and survived the first sleepless night home. Actually, the sleepless nights lasted another 3 days, or at least till we had to send Emily back to hospital for at least 24 hours for phototherapy cos her jaundice level was too high at 263 instead of the normal range of 100-180. THAT was when i really had a good rest that night despite having to express milk somewhere in the early morning. When we changed our flight ticket departure date after knowing of Emily's EDD, I thought that 1.5mths from her EDD is enough for us to get ready. As the day draws closer, plus the fact that my gynae is going to be away from 28th Apr till 8th May...and my hoped date for Emily to arrive on 1st May was really quite slim, we opted to go for elective induction on the 26th Apr. Delivering anytime after 1st May would mean that my confinement period will stretch till when Ww is away and there is less time to apply for the visa which takes 4-6 weeks. We don't want any hiccups at that part. So....despite me feeling uncertain about having her to arrive early (but safely early cos she'll be considered full-term then), we went ahead on 26th Apr. We were slightly more prepared that way, I could prepare Eliza and go through all the things that will happen in the days following the delivery, tell her what to expect etc. She'll definitely have to stay over at my mil's place which is quite new for her and without mummy & daddy so i was uncertain how she'll fare. Anyway on 26th Apr, we had my gynae appointment at 2pm. I had to go eat Mos burger cos i was craving for the coffee milkshake. (I faintly remember that we ate Mos burger on the day before Eliza arrived). Dr Tan measured Emily from the ultrasound scan to be about 3kg and doing well. I was concerned that usually early induction or those that have no medical reasons ends up in c-sections and the risks. He did say that there are recent research proving otherwise, also because the babies, though full-term, are smaller and show less complications. Anyway we did go ahead with it (obviously!). That day was really quite a busy day! There were about 3-4 mums-to-be going to be induced. wow...maybe it was because my gynae was leaving the day after eh? We had to wait till about 4pm for the person before me to be done at the CTG. By then, after inserting the pill (Prostaglandin) and checking, i was already 2cm dilated. Like everyone says, that the 2nd time labour will be much faster, my gynae expected me to come back in around midnight or earlier. (after 11pm would be ideal so that the hospital charges us for the next day fees instead). So we took a bus back to my mil's place for dinner. Eliza was to stay there for the night which at some point she found it quite fun. When we told her that Emily's going to come out soon, she laughed. yeap...laughed. I couldn't quite decipher whether she was happy that finally Emily is coming or that she can't make out what to expect, that's why she laughed. Anyway we went back home to pick up more things Eliza needs. I bathed and packed my bag. I wanted to eat curry puffs and we eventually took bus 518 and headed to Orchard for curry puff from Old Chang Kee. Oh...and to satisfy my other craving, i finally managed to drink my fav Mos coffee shake. Actually on the way there in the bus, i was feeling the contractions. They were bearable and probably about 10min apart. This time round i really felt the contractions. During my 1st delivery, I think i didn't really feel the contractions till my gynae broke the waterbag. Anyway, we arrived at Orchard, found Old Chang Kees and I ate to my satisfaction. By the time we were at Mos burger drinking the coffee shake, I felt that the ache from the contractions and wanted to go off to TMC. I don't want to be stranded in Orchard with painful ones! At least we'll be at the hospital when it really hurts. By the time we arrived at TMC, it was only 9+pm. So we waited at the lobby....till hopefully 1030pm or later. By 1030pm i wanted to check in already...we waited at the admissions but the person in front of us took so long. Fortunately, a staff came by, asked a few questions and sent me to the delivery ward to get ready while Ww does the admissions. At the delivery ward, I was sent to go change and strapped at the CTG to monitor baby's heartbeat and the contractions. The nurse came by and asked a lot of questions, which was asked again by another nurse. Meanwhile, for what seemed like a long time, I was just lying there and watching the CTG machine waiting for someone to come by and tell me what else to do. By the time the nurse sent me to clear my bowels, the contractions were stronger, so i had to do those breathing exercises to kind of take my mind off the pain and relief it. By about 1215am, Dr Tan came by to check how i was. By then i was 4 cm dilated. He also broke the water bag to get the process going faster. He said that i was in active labour so should be ready about a few hours or less. Meanwhile, Ww was still doing the admissions (it took so long cos he was sent to the family room and no one called him for a long time). Ww finally came at 1230+am (i think), while we chatted, I had to stop talking and do the breathing exercises cos the contractions were really getting much more intense. It came to a point when i had to ask him to call the mid-wife and he still asked me for what matter. I think at that point the contractions were getting much more intense and I probably did feel a bit like pushing. So when the mid-wife came and did the VE, i was 6cm dilated and they finally did send me to the delivery ward. (the last time i remembered we were already at the delivery ward for quite a while). Gosh...on the way there, even though it was short, the pain was getting worse. Somehow, i dunno why i didn't consider epidural then. Anyway, the mid-wife asked me if i wanted to use the laughing gas, and she said to keep breathing in and out...it's how it works. Basically, the gas makes you feel soooo drowsy that it takes your mind off the pain. Then again, it would say it makes one feel delirious, to the extent that i don't really know what is going on. Not that i bothered at that time...i just needed to tolerate the pain. And what seemed like moments and no pushing at all, baby Emily was out. Ww said she kinda slipped out (cos she's so small!) 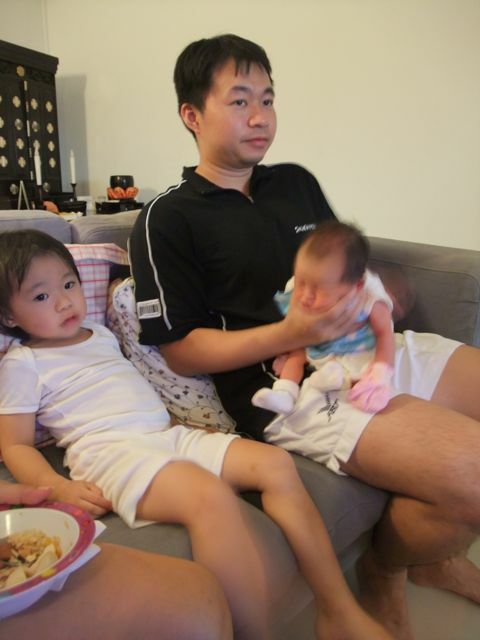 Later on Ww told me that the mid-wife had to hold baby's head till Dr.Tan came to receive the baby. Somehow i vaguely remembered someone say not to push yet or something...then again, i can't remember if i had pushed or not. See....delirious. It was a great relief to hear Emily's cry and to be out of that delirious state and out of the pain. Interestingly, I didn't have the medications like the drip or any other medication like the last time round. No episiotomy either but there was a slight tear and so I still had 1 stitch. Thankfully, this time round the recovery is so much better and less painful. Except...I felt the stitching. *shivers* Probably not as bad as the labour pains, but a different pain. (I did wonder at some point if there will be any pain relief if i had to have an episiotomy, there is anyway which i later found out) After all i wasn't on any pain relief so generally i felt everything. Thank God for Emily, for a smooth delivery and it IS possible to do without epidural. It's so exciting to have Emily with us :) it's like we are re-living the time we had Eliza. And Emily looks quite like Eliza, just a little rounder and as S noticed, thicker lips. She has slightly more hair than Eliza though looking at her now se does have a lot more hair...and all over her body too. It those soft fine hair that you can't really see unless you look closer. There's even hair on her ears.